Every company should have one. They're the people responsible for making sure new technology is implemented into existing companies. It's a role that absolutely every company should have. It's the only way you're going to reach maximum efficiency and productivity. But even technologists need to get better at what they do. 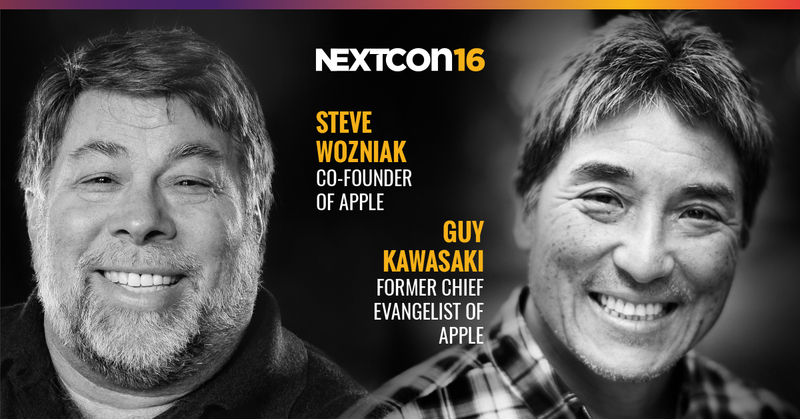 NextCon16 provides the perfect opportunity learn from the best including Steve Wozniak, Guy Kawasaki, and Darin Brown. It's a chance to take your skills to the next level. With 75% of people using social media to find information on big figures, the chances are you've done the same. Now it's time to go further than that. So why should all technologists be attending conferences, especially NextCon? Technologists are often seen as the gurus of their company because they understand the latest technology. But even technologists need to learn from someone. That someone may just be at your next business conference. Attending conferences allows you to gain new perspectives and look at things in a different light. For example, at NextCon16 you'll have a chance to learn from people who have worked for the biggest companies in the world. The agenda is filled with inspiring speakers who have done it all before. Conferences aren't just about sitting in a room and listening to someone talk. That's not how people learn, and it's certainly not how technologists learn. Technologists are a different breed because they need practical, hands-on methods they can use because that's what their job is all about. Sessions at conferences like NextCon16 can provide new skills and new attributes to even the most gifted technologists. You can then take these skills back to your company and implement them. They could give you the competitive edge you need in your industry. Technologists are responsible for implementing new technology into the organizations they work for. This is a hard job, and it doesn't leave much time for browsing industry news. It means many technologists are in the dark about some of the new innovations that have recently hit the market. At NextCon16, you'll be introduced to new technology you've never seen before. This new technology could be the 'aha' moment that may change the way you do things forever. Not to mention, it's a chance to get informed and get better at what you do. Conferences are not just about the sessions you attend. That's a small piece of what it's all about. Conferences bring together representatives from companies inside and outside of your industry. It's a chance to make connections - swap business cards, shake hands, and organise business lunches. Anyone can tell that making connections in your industry is one of the most important parts of building a successful company. At a conference like NextCon16, you will undoubtedly meet people worth knowing from across the country. Don't pass up on an opportunity to attend a networking event. Conferences have strayed away from the lecture style that used to dominate the agenda. They're now all about being able to interact with the speakers on stage. Technologists can take this opportunity to ask the big questions that they've been wondering about. They're going to get educated answers from experts in their field. Think of it as personal coaching. The information you take away will be invaluable, and it will be a good investment for your company. Last Word – Why Not Attend? Conferences like NextCon16 are a time to learn. There's no reason not to attend because you're going to have a chance to learn from the best and ask them questions. It's an opportunity that could change your organization. Have you ever attended a conference before, and what did you get out of it?